This is the precise moment to look at all sides of this matter, it is said in the communities. In order to realize that there is not one whole truth, but many voices, interests and ways to build and understand development; it is also the opportunity to talk about the different rights, not only about full ownership. The Encounter “Communal lands, Rights and Sustainability” was celebrated in Guatemala City on May 11, 12 and 13, 2011. This activity was organized by some AGTER´s members from Central America: Laura Hurtado, Patricia Castillo, Pierre Merlet, Iliana Monterroso and Silvel Elías, and Michel Merlet from France. The convocation was supported by the Guillermo Toriello Foundation, the Mundubat Foundation, the Program for Territorial and Rural Studies from the San Carlos University and ActionAID. Financial support was provided by the European Commission. 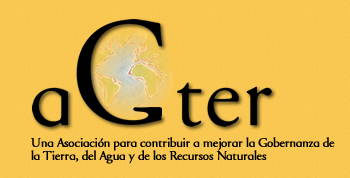 It is important to notice that this is the first public activity carried out by AGTER in Guatemala, amid a particularly relevant conjuncture which reflects a new phase of land grabbing. This phase is characterized by the size of the land involved, the diversity of megaprojects affecting all natural resources and mainly by the high levels of violence being imposed on communities. This situation is deepening the agrarian crisis, linked to a large global phenomenon. The meeting was conducted in two stages: a public conference attended by 200 people (global trends in land grabbing, the situation in Guatemala, communal lands and indigenous territories and sustainable management) and then a meeting in which representatives from communities and peasants’ organizations in communal lands and several indigenous territories in Guatemala, Nicaragua and Costa Rica, shared their experiences on three areas of analysis:1) communal lands, megaprojects and resistance 2) Management and Nature 3)recognition rights and legal protection. Through the meeting it became evident that this new phase of land grabbing is the main threat to people’s rights to land and natural resources as well as to the prospects for development, food security and the lives of communities on communal lands. This situation requires us to know and reveal the dynamics that are being installed in the territories as well as at global level and to promote community empowerment and articulation of various forms of resistance, organization, political incidence and mobilization against a phenomenon that is largely marking the development model for all humanity, expressed in forms and specific problems in each area. For AGTER´s members, the event represented a qualitative leap in relation to the possibilities for contributing to the analysis and the discovery of the potential from community experiences. It is now our task to share with the membership of our Association, the findings, proposals and the systematization generated. Patricia Castillo H. is member of AGTER. She is Guatemalan and works with the Toriello Foundation. The present newsletter covers exceptionally four months instead of two months. Several documents in this newsletter are part of a series of teaching notes on land tenure in West Africa developed by a consortium including, AGTER, The Rural Hub, the LandNet West Africa, the ROPPA, the GRAF and supported by the Technical Committee Land and Development (AFD, MAEE – French Cooperation). Additionally, we highlight the contribution made by AGTER during the World Social Forum in the preparation of the DAKAR appeal against land grabs and the signing by AGTER of this appeal.